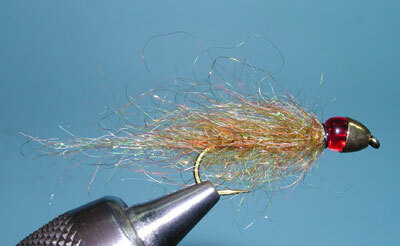 Notes: The Mohair Leech is one of my favorite stillwater flies. I first saw this pattern in early 1990 on Crowley Lake. It is thought that Jack Shaw and Mike Andreasen are the originators of this pattern using Canadian Mohair Yarn, which is a coloration blend of Angora Goat. Jack Shaw designed his Blood Leech in 1965 using burgundy-dyed wool. Later, in the 1970's, Jack bought some Canadian Brown Mohair yarn at a local knitting store in Kamloops B.C. with numerous fiber colorations. This coloration change to his pattern greatly increased the number of strikes. The word was out that there was some secret Canadian Brown Mohair and Jack had cornered the supply. Utah resident Mike Andreasen frequently fished the B.C. area and came in contact with Jack's pattern. 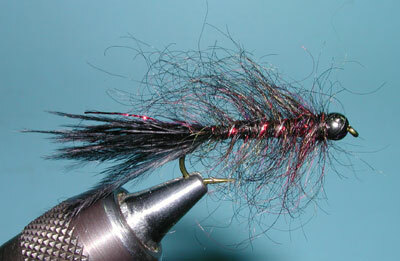 Mike adapted Marabou for the tail and tried a number of Mohair yarn colorations as well. Through Mike's introductions, the pattern spread throughout the Western States in the 1980's. The fly is usually tied in sizes 6-10. The Angora goat fibers extend from the body sparsely which helps give it an undulating motion. It is best weighted with a bead and/or lead wire in the front half to enable the fly to give a jigging effect upon retrieval. 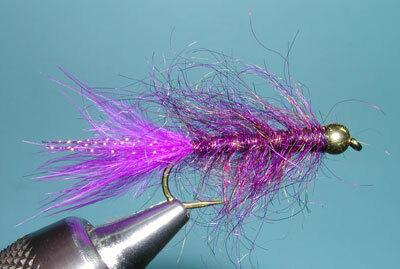 The Mohair Leech can be tied with a number of colors such as Olive, Black, Purple, Maroon, and Brown. A Black or Black/Brown tail variation is often used, especially with the Brown Mohair Leech. The body can be formed using a 4" piece of Mohair yarn in which the fibers are laid back in a 90 degree angle as the yarn is wrapped around the shank. Another method is to pull away the fibers from the yarn into a separate pile from which you can add various colorations and apply the material as a dubbing around the thread. The strands are brushed with a wire brush to bring the fibers away from the shank. A third method is to use Angora Goat dubbing and mix your own Mohair coloration, I also like to add some Ice Dubbing or Lite Brite to provide some sparkle. A number of material distributors sell Mohair yarn on spools or cards, others apply the Angora Goat hair to a thread core and market the material as Leech Yarn. I prefer to work with packages of Angora Goat Dubbing and mix the colorations to suit. For the tail, I prefer Plume Marabou. Plume Marabou has small lateral fibers often extending to the tip. This creates a fuller tail without increasing the number of fibers. 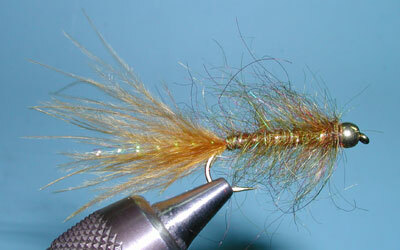 Don't apply a full Marabou tail, as in a Wooly Bugger, yet it should be as long as the shank. This tail needs to be sparse and the plume marabou fibers help keep the tail from looking too thin. Beadheads are common on these patterns. If a bead is not chosen, then you do need to weight the front half of the fly to get the proper undulating action in the "strip and pause" retreive to mimic an actual leech. Brian Chan of Kamloops BC came up with his variation in 2005 with the Ruby-eyed Leech. Rather than attaching a Marabou tail, Brian used a tuft of Mohair material (which is what Jack Shaw did forty years earlier). The body is a mixture of Angora Goat, Simi Seal, Ice Dubbing, and a small amount of Lite Brite. Blend this mixture with a short spurt from your blender. Attach a number of fibers at the bend of the hook and rope the material. Place the roped dubbing within a dubbing loop and twist the loop to secure the material. Wrap the material within the loop up to the bead and whip finish. The fly is finished by extracting the individual fibers with a piece of velcro. The Ruby colored glass bead represents the gill segment of a bait fish and is a triggering mechanism. 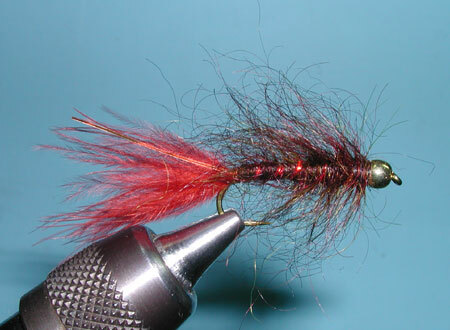 Brian also likes to tie this pattern in a Black and Red coloration.